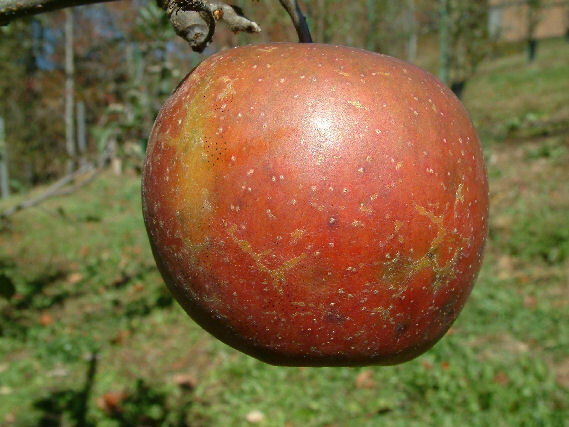 Stark is an apple that originated in Ohio around 1869 and was widely grown there for years. It is a fine, late-keeping apple well suited for commercial markets. The tree is vigorous and highly productive, but susceptible to fireblight. Fruit medium to large, oblong to conical and occasionally ribbed. The greenish-yellow skin is mostly covered with dull red and purple splashes and stripes, sometimes almost entirely red. The greenish-white to yellow flesh is crisp, coarse, firm and moderately juicy. Ripens late winter.